Students examine the ways in which changing attitudes towards the environment influence politics, government and non-government organizations. 1. Students recognise that Australian indigenous art is the oldest continous art tradition in the world by visiting a local indigenous art gallery or inviting a member of the indigenous community and/or a art gallery owner to class to discuss indigenous art. 2. 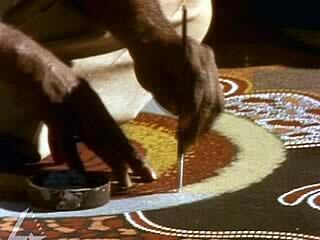 Using evidence from the paintings in the video clip, discuss the concept that indigenous art is like a topographic mapping of land and culture. 3. Using the internet, the video clip and other sources investigate how and why a central focus of indigenous art is their environment. Given the long tradition of this indigenous art form, how might the recent intense interest by non-indigenous people in indigenous art have an impact on peoples’ attitude towards the environment and towards governments’ policies about the land? 4. In pairs research examples of traditional Australian Indigenous art that derive from a specific locality or geographic region. Prepare an informative written and illustrated report of about 500–700 words discussing the various features of the art, and the ways in which it expresses elements of the Dreaming.